Discovering roots and growing goodness in the big, bad city! Soil Info – the Dirt on Dirt! Growing from Seed – The Art of Propagation! What’s a meal without the flavor of different herbs and spices? And what a treat to be growing some of them in your own farm! It’s easy in our climate, and absolutely wondrous to watch how common kitchen spices (think turmeric/haldi, pepper/kaalimiri, fenugreek/methi seeds, fennel/saunf) transform into their plant avatar – good to look at, great to eat! 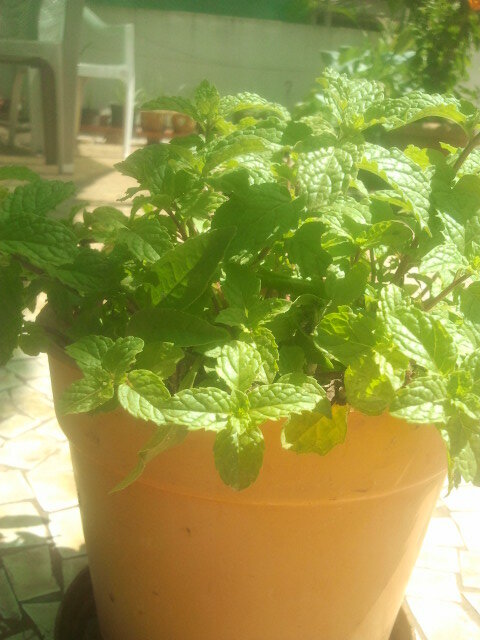 A cheerful pot of Mint/Pudina! Mint is easy to propagate, and a great starter plant for wannabe urban farmers. Even a few twigs stuck in the earth will grow forth to populate several containers and more. It provides useful, edible ground cover, and I grow it around my palms, rose bushes, okra and tomato plants. A cheerful pot of mint, like the one above, makes a super gift item too! Chillies are hardy plants, providing a steady and bountiful harvest from a young stage. Don’t make the mistake of growing chillies indoors (I once did!) as the chilly flower will not pollinate (unless you have bees and butterflies at home)! 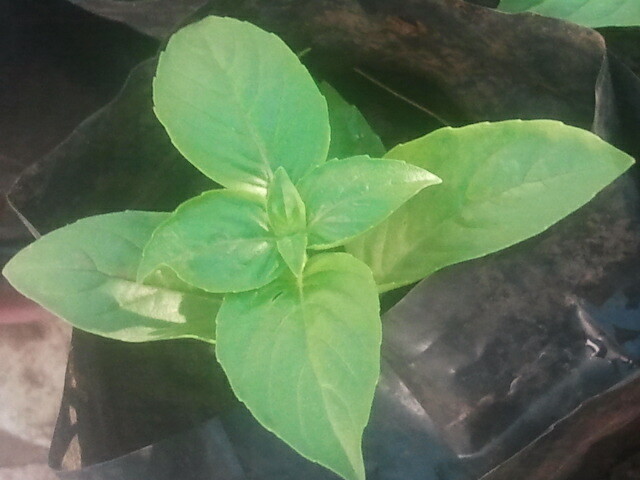 This is a pic of Italian basil – the Indian variety is called Tulsi. It’s one of the sweetest smelling herbs to grow besides being hardy, quick and good-looking too! The easiest way to propagate it is through cuttings. If you don’t know anyone growing Italian basil, visit any upmarket veggie shop and buy it fresh, then rush home and plant the sturdiest stems in a super sunny spot. And the Athlete of the Year Award goes to…..Ajwain! 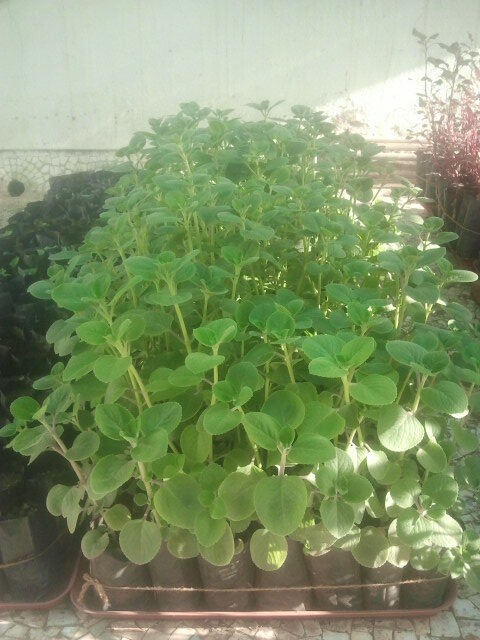 Ajwain is simply the most awesome, unstoppable grower in my little urban farm. A friend gave me a single cutting and within three months this is what I got! Ajwain is hardy, repels insects, discourages weeds, perfumes your garden and looks amazing. Now that I have so much of it, I don’t know what to do…does anybody want some?! So much to look forward to as I wait for the turmeric, ginger and garlic to come overground! I’ve grown garlic before (the shoots are just as edible as the root flakes) but this time around I’ve planted them alongside bigger plants to (hopefully) ward away leaf eating worms. The ginger and turmeric shoots are just appearing and I cannot wait to see them unfold! Will keep you posted on their story, along with photos of my hardy curry leaf/kadi patta bush, on-off fenugreek/methi cultivation (we eat them faster than they can grow!) and plans to grow the fully edible fennel/saunf plant – yes that’s right, roots, stems, leaves and flowers can all be eaten!!! Until the next post, happy growing! © Mumbai Farmer 2013. Do not copy in part or whole without prior written permission from the author. Infringement of copyright will render you liable for legal action. 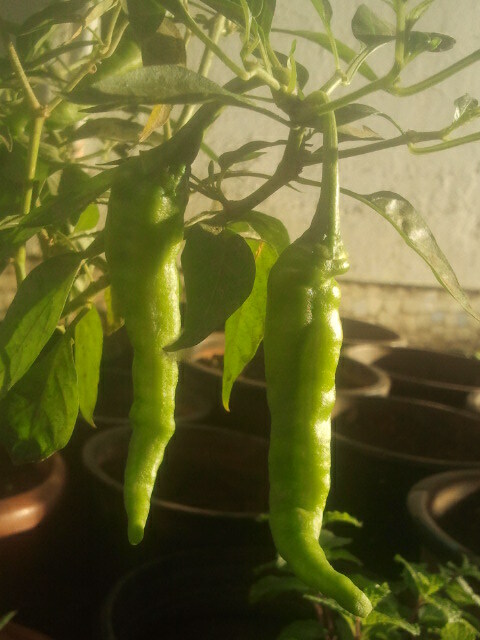 This entry was posted in agriculture, Bombay, city, Container, Farming, Gardening, green, herbs, Hobby, Organic, spices, Sustainable, Terrace, Tropical, urban and tagged agriculture, ajwain, basil, chili pepper, chillies, container, curry leaf, farming, fennel, fenugreek, garden, garlic, ginger, grow own food, haldi, hobby, kadi patta, kitchen garden, lifestyle, methi, mint, mumbai, oregano, organic, plants, pudina, saunf, sustainable, terrace, turmeric, urban on May 9, 2013 by Mandy. thanks for the lovely post.,..encouraging! Thanks for the “like” 🙂 The current content was inspired by readers like you who wrote in with suggestions. I will try my bestest to add more detail on individual plants soon! Sure, it’s still growing strong 🙂 I think you are on our fb group, right? In that case, pls connect with John (Andheri) for cuttings, or me (eastern suburbs) – whichever is more convenient. Hi guys can u help me in finding a place where I can get herb plants like sage ,oragano,basil ,thyme,chives.???? Hi Daniel – there are no guys here but please allow me to answer. It is near impossible to find saplings/plants of the type you mentioned, in Mumbai. You can get seeds in any good nursery. The other option is to procure cuttings from the fresh veggie market, or friends growing these herbs – then follow the growing out instructions on each of the herbs in PLANTOPEDIA and grow your herbs from scratch. Very nice info… Particularly helpful as its specific to Indian conditions in urban settings… Nice to know there r so many around to ask for advice since I’m a newbie myself. And I Would luv sum ajwain starters!! !keep up the good work! I NOW offer WORKSHOPS IN growing herbs, MICROGEENs, veggies + COMPOSTING, organic farming, permaculture & water harvesting! Your venue, 3 hr sessions, min. 10 folks, with course materials & green giveaways! Please email mandy_kumar@yahoo.com for details! Share my adventures in urban farming! And How Does My Garden Grow?